Keurig was founded in Massachusetts in 1992 where it gave birth to the single-serving coffee pod. The name itself means “excellence” in Dutch and has come to replace most coffee pots in offices to allow for a more customizable caffeine experience. Since the beginning, K Cup popularity has skyrocketed. Now, 1 in 3 Americans uses some form of a single-serving coffee pod in their home in lieu of a drip pot or pour-over method. For more on other methods of brewing coffee, click here. In 2014, multiple people attempted to estimate how many Keurig cups were disposed of that year. 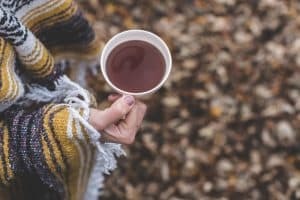 Although Keurig does a good job of keeping these statistics secret, reliable estimates could still be made with enough research. The best estimates claimed that in 2014 the amount of Keurigs put into the ground could circle the entire Earth over 12 times! In 2006, Green Mountain purchased Keurig. Green Mountain is known for being eco-friendly and it is true, they made a push to create recyclable K Cups. The problem is that to recycle these single-use pods, they must be disassembled and sorted between metal, paper, and plastic. The whole point of K Cups is the convenience of having a one button option for whatever coffee sounds decadent at the moment. The good news is that Green Mountain created another option–the reusable K Cup. The one time use K Cups charge around $40 per pound for plain-jane, standard coffee grounds. These plastic throw-away cups are not only wasteful but expensive. By purchasing a reusable K Cup for your Keurig, you will be able to purchase any kind of coffee you desire. Even if you buy the Green Mountain coffee brand, you will save more than $20 per pound of coffee. By making the switch, your budget will be liberated and more money can be spent choosing higher quality beans. For more on choosing coffee beans, check out this article. In addition to being eco-friendly and less expensive, the reusable K Cup allows the coffee connoisseur to control more of the variables than a pre-made one-use K Cup. The reusable cup allows you to choose the type of coffee you like and the grind size which will affect the strength and taste of the coffee. 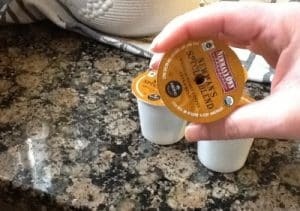 The one-use K Cups are filled with stale coffee. By switching over to the reusable K Cup, you can still have the convenience of a single cup brew with the freedom to use fresh ground beans. This changes the Keurig experience completely. When reusable K Cups started showing up on the market, Keurig tried to combat the sale of generic brand cups by creating the 2.0 machine. The 2.0 machine only permits Keurig specific K Cups to be used. Inside of the 2.0 machine, there is a small laser that scans the K Cup to see if it is made by Keurig. If the laser does not register the K Cup, it will not brew. To combat this, the Freedom Clip was created. 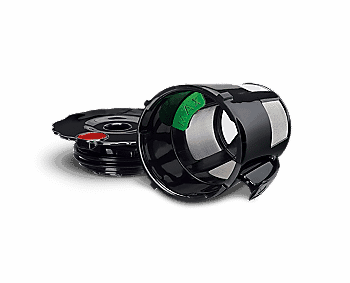 The Freedom Clip tricks the Keurig machine into thinking that any K Cup is compatible with the machine allowing you more options when purchasing reusable K Cups. Purchase a Freedom Clip here. This model includes a Freedom Clip already on the K Cup. Instead of being made of plastic, it is made of a strong mesh material. These K Cups are dishwasher safe. 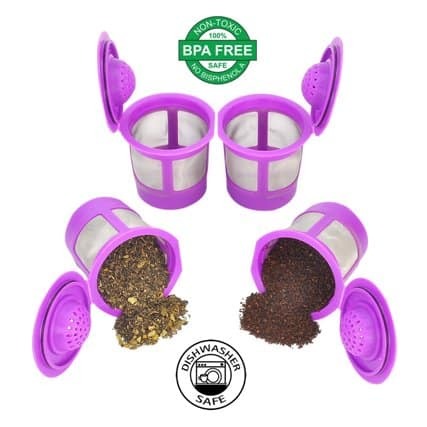 The four pack is great because it allows you to designate cups specifically for teas and cups for coffee, keeping your beverages pure and delicious. This is compatible with most machines, including: Keurig B31, B40, B44, B60, B50, B66, B70, B77, B200, B140, K15, K31, K40, K44, K45, K50, K60, K66, K70, K77, K100, K135, K140, Breville K-cup, Mr. Coffee K-cup , and Cuisinart K cup. This company also has a 100% money back guarantee. The rating for this brand is 9.5, making this one of the most popular purchases on the market. These are black except for the wire meshing. These cups are compatible with both the Keurig 1.0 and 2.0. Delibru has made these cups BPA free. You can wash the reusable cups in the dishwasher. The rating for these cups is 9.2. This K Cup comes in a color one shade deeper than lavender. 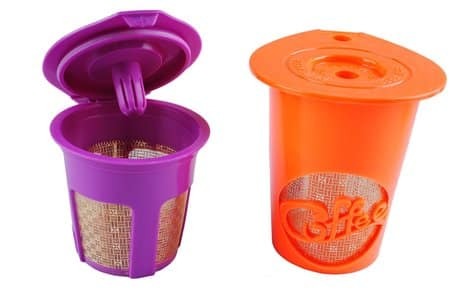 These K Cups are made of BPA free plastic and wire mesh. To purchase or learn more about Delibru, click here. Each K Cup in this 8 piece set is a different color. The plastic is BPA free. Youngever has a 100% money back guarantee. The customer rating on these cups is 9.0. 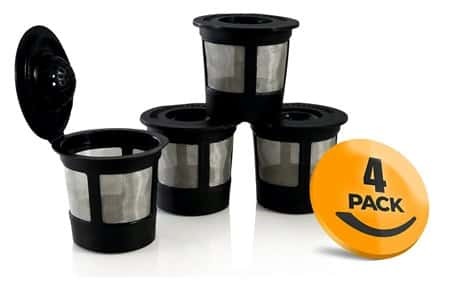 These reusable K Cups are compatible with: K15, K40, K45, K55, K60, K70, K75, K145, K150, B30, B70, B40, B44, B60, B145, B140,B200, B3000, K200, K250, K300, K350, K360, K400, K425, K450, K460, K475, K500, K525, K550, K560, and K575. This comes with a two-piece set. There is one K-Cup and one Carafe. The K-Cup is purple and the carafe is orange. The Carafe is compatible with: K300, K350, K400, K450, K460, K500, K550, K560. However, it is not compatible with K475 or K575. This set is cheaper than many online but is only given an 8.5 out of 10 rating. It is composed of a sleek metal basket and bright colored plastic. In addition to the two cups, the pack also comes with a spoon brush. To look at more reviews and product information, click here. This is the only K-Cup approved by Keurig for use on their machines. 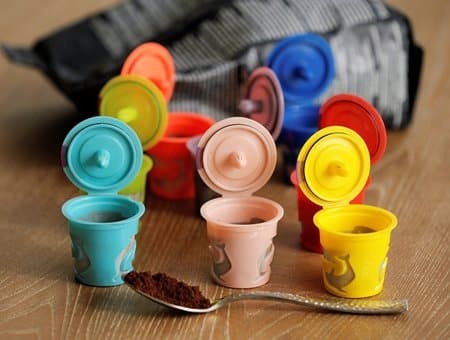 Out of 126 reusable K-Cups off the web, this one ranks in at number 7. The filter can be used for both single cups of coffee and travel mugs. It comes in a solid black and is designed for easy cleanup. 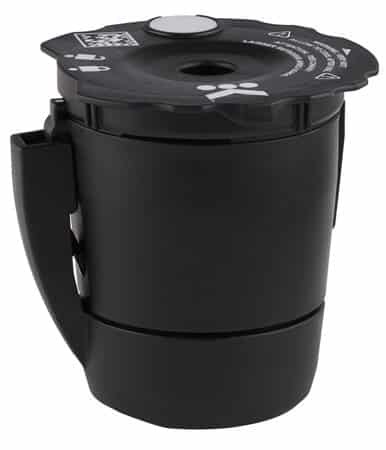 The universal coffee filter is compatible with both the Keurig 1.0 and 2.0 models. For more information on Keurig’s Universal Coffee Filter, follow this link.